The United Nations Legal Counsel delivered opening remarks on the first day of the plenary part of the forty-sixth session of the Commission on the Limits of the Continental Shelf. 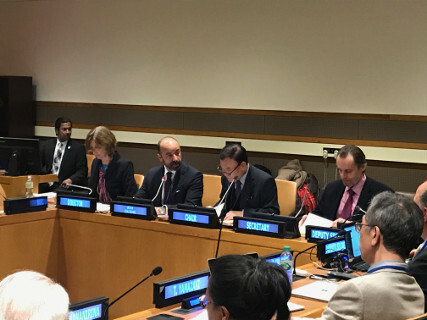 As this was his first opportunity to join a session of the Commission following the election of its members at the twenty-seventh Meeting of States Parties to the United Nations Convention on the Law of the Sea, he congratulated its members on their election, and Mr. Yong-Ahn Park, on his election as Chair of the Commission. The Legal Counsel underscored the importance of full membership of the Commission and informed the Commission that he had addressed a letter to the Chair of the Eastern European Group of States concerning the vacant seat in the Commission. Referring to the importance that the General Assembly and the States parties to the Convention attach to the work of the Commission, the Legal Counsel recalled that States parties are still working on the issue of the conditions of work of the members of the Commission. In closing, he expressed appreciation for the productive work carried out by the Commission during its first two sessions and renewed the commitment of the Secretariat to support the Commission. The Legal Counsel at the forty-sixth session of the Commission on the Limits of the Continental Shelf.